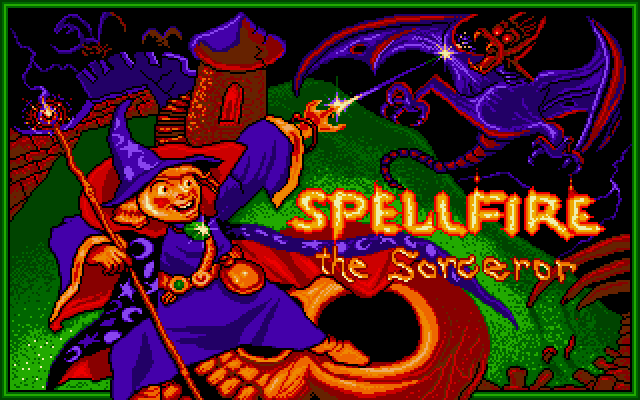 Spellfire is a scrolling platformer set in a time long ago. A time of myth and legend when silly knights frantically patrolled the woodlands, gorillas enjoyed throwing rocks, and magicians were the cool guys. Our beef is with an evil emperor who is holding captive (wait for it) Fifi The Fairy in his castle tower and our valiant quest is to rescue her. He begins his journey in the forest which leads to the castle where she is imprisoned and this is a great start that nicely introduces you to the gameplay mechanics. 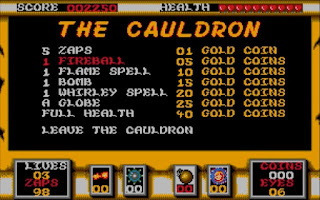 Our hero can walk, leap, climb trees, shoot fire-bolts and even mash up magic spells using a rather large cauldron. 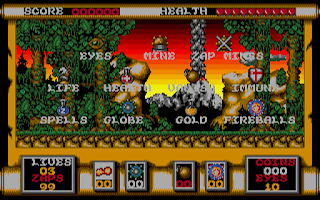 Your health status is displayed at the top of the screen and will decrease if you happen to touch the enemies or a dangerous object. 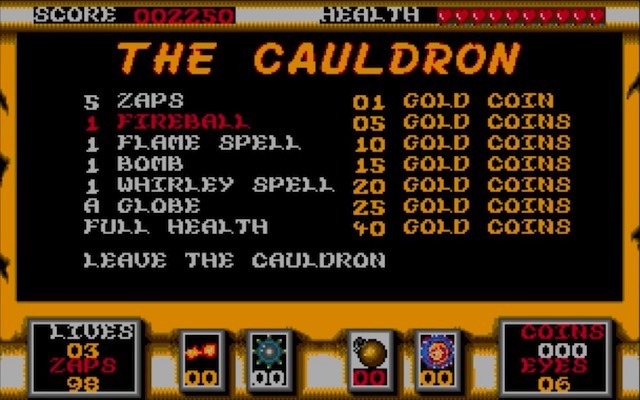 Gold coins can be collected (after a kill) and these are then used as currency in a cauldron, which offers magical power-ups, extra ammo, or a health boost. The only chance you have to rescue Fifi is by collecting all ten magic eyes which will allow you to fight off a guardian boss. The first is a wasp-like critter who isn't exactly intelligent and therefore makes for an easy kill. This grants us access to the castle via the dungeons which are creepy but the guardian is a bit of a bonehead. This castle takes us deeper into our quest but continuing with the same theme, with lots more tricks and traps to fool you. Spellfire has some truly stunning visuals and I love the medieval environments with their nice touches: the colourful sky, erupting volcanos, and those awesome skeletons being raised from the dead. The sprites have such good attention to detail and complemented by smooth scrolling that never lags to keep up with the pace of the gameplay. 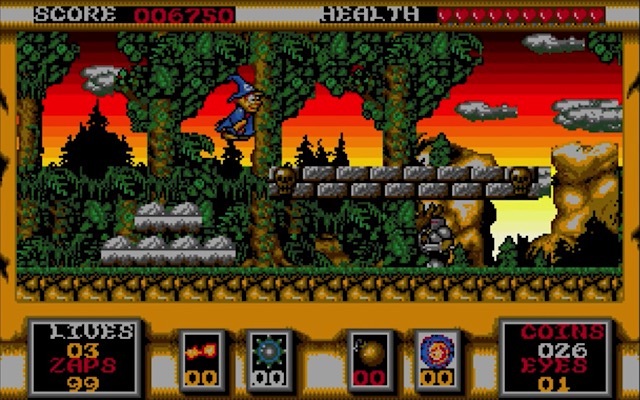 Audio is almost as impressive and can set to chipmusic or sound effects. Whatever you decide, you'll love it. 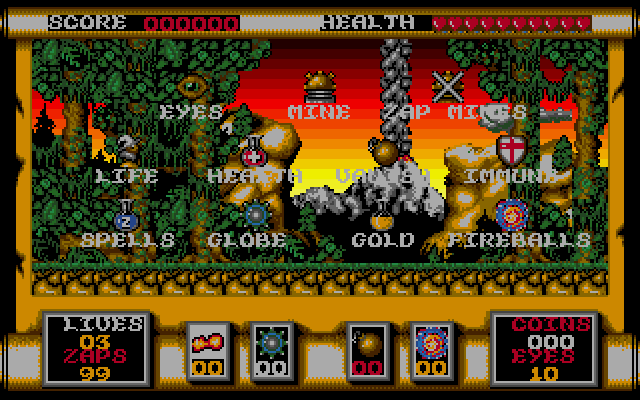 I'm grateful this isn't a lazy Amiga port and one which plays every bit as good as it looks. Code Masters released what I can only describe as a hidden gem that's easy to pick up and play and is a great platformer. Go and grab yourself a copy right now: hard disk installable game is available from 8BitChip with floppies found via Stonish. A long time ago in a galaxy far, far away... No, wait, wrong game!! Okay, let me start again, many moons ago a good friend of mine [Tom!] surprised me with a gift sent all the way from the land of the Vikings. 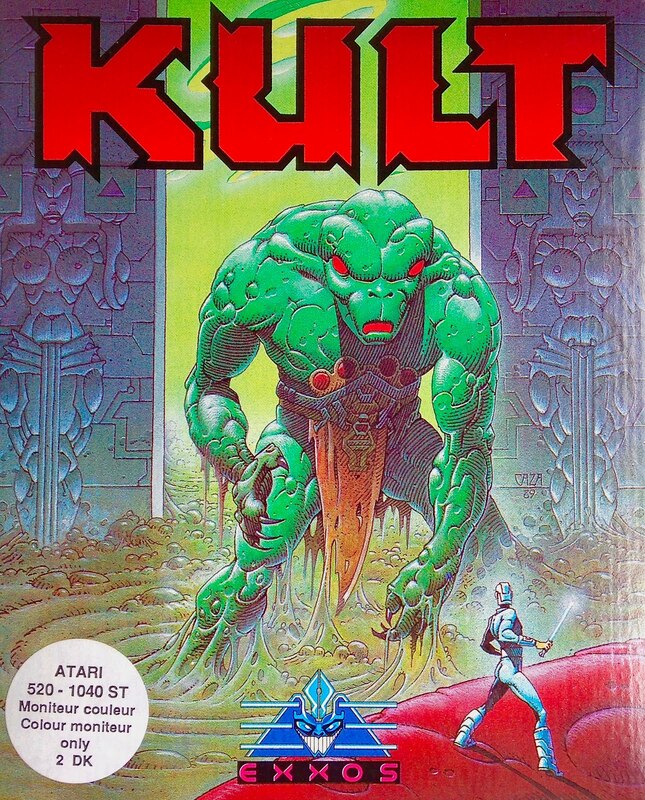 Inside was a beautifully preserved -sealed- copy of Kult, something I had never played before in my life. 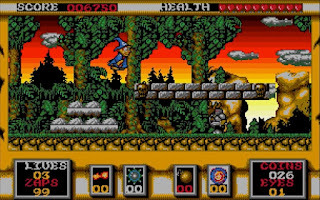 He was adamant that this was a true 16-bit classic and I remember it receiving good reviews, with Atari ST User scoring it a perfect ten. Wow!! You are Raven, a psionic mutant, who saw a bunch of other mutants destroy a village and now want to fight back! That's the gist of this story for what is a most confusing adventure with lots of cunning puzzles to solve. Kult is a game like no other I have ever played and has an enormous learning curve to learn, especially the user interface. Graphics are beautifully drawn in a creepy cool way and all sound effects are samples, love the speech effects! 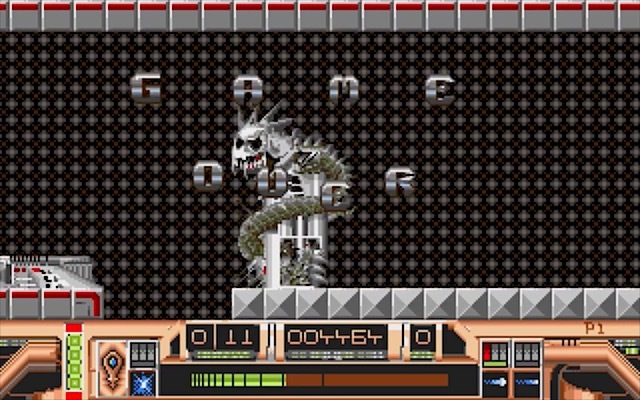 I've been getting to grips with this game today but the hard drive version fails to work for me (I think it's my SD Card) so I went for the floppy version, linked below, by Zuul and this worked perfectly. Well, after a couple of hours, I am blown away by this incredible and captivating game. The user interface might first appear confusing and quite laboured but in fact, it's actually anything but because navigation is a breeze. I also love how the rooms are titled, which certainly helps me a bunch! I'm currently getting to grips with the locations and examining everything I see in the rooms. Objects are often tripped-out and plain silly - I've just polished the eyeballs on a fountain to get it working, why I'm not exactly sure yet but I've done it. I have also chatted to some strange looking fellas, so I followed them and used the attack function. Won this battle but then his friends ate the corpse! This game is so different to anything I've played before. I love how its storyline is deep and involving but never overwelming. I feel that I've only just scratched the surface of what will be a unique experience! - 8BitChip has created a version to be installed on your hard disk. - Various floppy disks feature Kult and I recommend Zuul #195 via Stonish. - Wasabim has recorded a brilliant youtube video. Freddy Hardest is our Guardian Angel for Dinamic's scrolling beat 'em up in the Big Apple, which actually ain't too dissimilar to After The War. Manhattan always seems to be the perfect setting of a grim future for crime and violent gangs and we begin our Death Wish at the docks. From here, we are assaulted by waves of 80s-styled thugs and some have brought along their toys, like baseball bats and knives. Where's Charles Bronson when you need him? This is a game which doesn't take itself too seriously and will have you laughing at its many silly antics. I love how the baddies turn into zapped skeletons for a split second after killing them, like an old Tom And Jerry cartoon. Watch out for "Death Star", a forklift trucker called Ricky Chang who is probably the worlds worst driver. However, my favourite of all is being kicked out of your cute yellow boots when suffering that final deathblow. Classic!! The gameplay window is quite small with much of the screen being -mostly- pointless decor but I do like the detailed backgrounds, even if they're far too colourful for a bleak city scene! Sprites are large and well-detailed but the animations aren't the best. However, there are some cool effects and the Ricky Chang scene will always make me laugh! Each in-game sound effect is made from excellent meaty samples with the chainsaw guy being my favourite. Do take a few moments to experience the theme music, which is so bad it's worth listening too. Guardian Angel sure has some good qualities; a bucket load of humour matched by the responsive controls and superb sprites and sound effects. Sadly, it's simply too hard and only having the one powerful attack movement spoils any long term gameplay potential. However, I did enjoy playing this with a trainer enabled. That's a bad thing, right? - Medway Boys #85 features Guardian Angel on their Menu CD, thanks to Stonish. - Old Games Finder has lots of other floppy disks available to download. - Freddy (and his large jaw) appear numerous times in the AtariMania ST database. Fuzion #185 is a cool intro which gave us Ork, by Psygnosis. I love this intro because it presents itself particularly well with lots of colour and an adaptation of one of the most memorable chiptunes ever created. It also makes use of the Atari STe hardware for even better results, but happily works on either machine just fine. Okay, it might look ...umm... rather familiar but the gameplay is rock-solid awesomeness!! 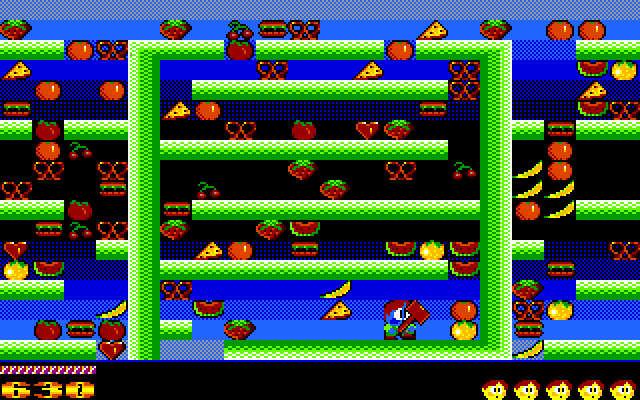 The game rewards this vicious act with lots of bonus fruits before respawning them at the top of the screen. Magic mushroom power-ups are available for a range of cool effects that may give you a boost or alter your visibility. A bonus timer is counting down and, if you manage to finish with time remaining, then you can build up points by grabbing lots of the goodies. What this lacks in originality is more than made up for in gameplay! Wow!! Look at all that gorgeous colour and beautiful fruit. Yum Yum get it all eaten up! Graphically, it's quite pretty and the sprites are gorgeous but those big-eyed blue faces will always make me smile - especially after I've clubbed them! Sound effects are great but a background tune would also have been nice. The controls are perfect and always responsive, I loved the ability to have two jumping options but the hammer only works horizontally. Interestingly, you can flip between 50/60Hz and also three game speeds, at any time. Kid GP offers an exhilarating experience for such a humble 8bit idea. Manically running around, collecting lots of diamonds and avoiding the silly nasties is surprisingly challenging. Dave Munsie may have intended this game for kids (my 7yr appreciates that) but there is no denying the effect it had on this big kid. A fantastic game!! Aranym is a fantastic piece of software that enables us to create a powerful Atari computer capable of running our favourite GEM software - but at lightning speeds. However, most find Aranym rather awkward to set up from scratch so a chap called Philippe Noble went and created something very special called EasyAraMint. This is a ready-to-go installation based on EasyMint 1.18 and offers an incredible multitasking environment using the power of the host Mac/PC. As you can see in my expertly recorded video, I'm using my old Mac Mini which was recently given to me (thanks Mum!). This is running EasyAraMiNT where I run 'scp' and then view images/PDF. Then I listen to some cool tunes and play a little Doom before finishing off browsing the web!! This software can be installed in minutes and comes stacked with a raft of Atari goodies included. Philippe has done an outstanding job and created a ready-2-go multitasking GEM platform which I highly recommend. FTP, command line, image editing, and much more. What an awesome OS!! 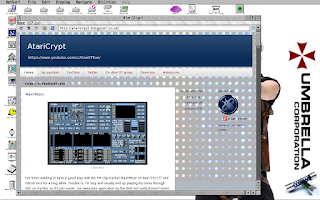 Heck, why not browse the web, read a PDF and listen to some cool chiptunes? Jug is a scrolling shoot 'em up released by one of my favourite companies, Microdeal. Set in the distant future, we are tasked to save Spiraeus, a living planet, suffering a nasty tumour, which we urgently need to eliminate. However, its autoimmune system sees you as a threat and decides to unleash its defences intent on your demise. Oh, great!! Programmed by Paul Hunter, of Armour-Geddon fame, this is obviously no lazy conversion and certainly pushes our old STFM to the limit. 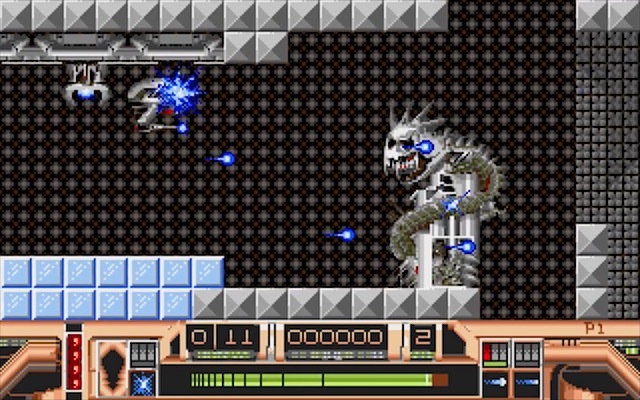 Playing Jug is a strange and frantic affair, it combines elements from various other games: Blood Money, Custodian, Droid, and Return To Genesis. Your ship moves left or right but also has the ability to fly. However, this is affected by gravity, similar to Alien World, and also requires fuel top-ups... The controls work well but movements are a little slow thus making it difficult avoiding the nasties without losing precious energy. Some of the eye candy is pretty ghastly whereas others are great examples of beautiful artwork. 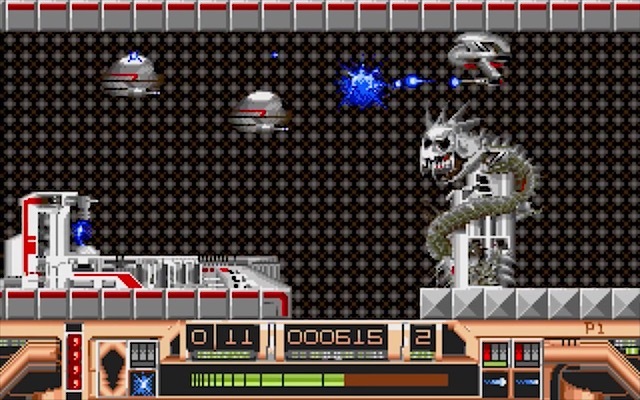 The action is relentless with lots of baddies constantly zipping across your screen in various attack waves. However, they aren't the brightest bulbs and appear to move/shoot blindly with little AI thus offering much of a challenge - it's almost like they aren't even aware of our presence. 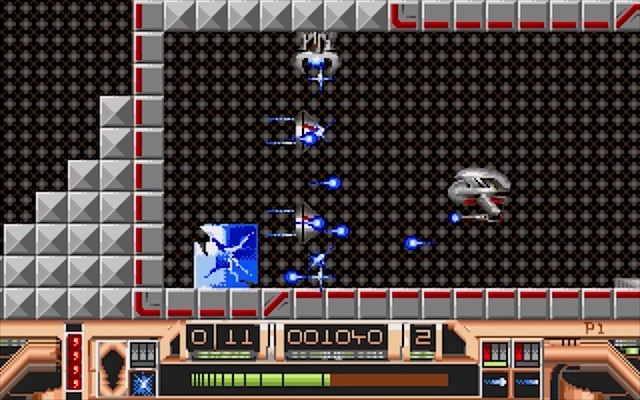 Weaponry is an upgradeable mixed-bag: however, the plasma gun is mounted far too low to be fully effective. Replacing that with a laser cannon is lots of fun!! The best thing about Jug isn't its humorous name (based on the ship's barrel-chested assets!!) but the visuals. These are utterly gorgeous boasting ultra smooth parallax scrolling using a cool metallic palette. Martin Kenwright has done another amazing job and you should use a real Atari ST to fully appreciate the graphics breezing across your screen. Theme music is a masterpiece, by Paul Shields. So leave the main menu be and enjoy the incredible chiptune! In comparison, the in-game sound effects are totally overshadowed, but they do their job good enough. Look out for teleporters but when death comes at least it's pretty demoscene'y. Which I love! Jug has all the ingredients to be a brilliant shoot 'em up but incorporates some weird mechanics that hogged my desire to continue playing. I would recommend any of the above-mentioned games along with Uridium, Cybernoid, or Sideways!! Hmm, I'm still on the fence with this one which has left me with lots of mixed feelings. Unsure. Okay guys, the all-important links. Firstly, if you have a hard drive or Ultrasatan then grab this download which is so cool. Floppy disk addicts can find Jug on the Stonish website. Finally, and untested by me, here is how to get infinite energy and extra lives: press and hold down the ESC key on the title screen and use the mouse to click on the right-hand edge of the picture. This should help the game be a little more achievable!! 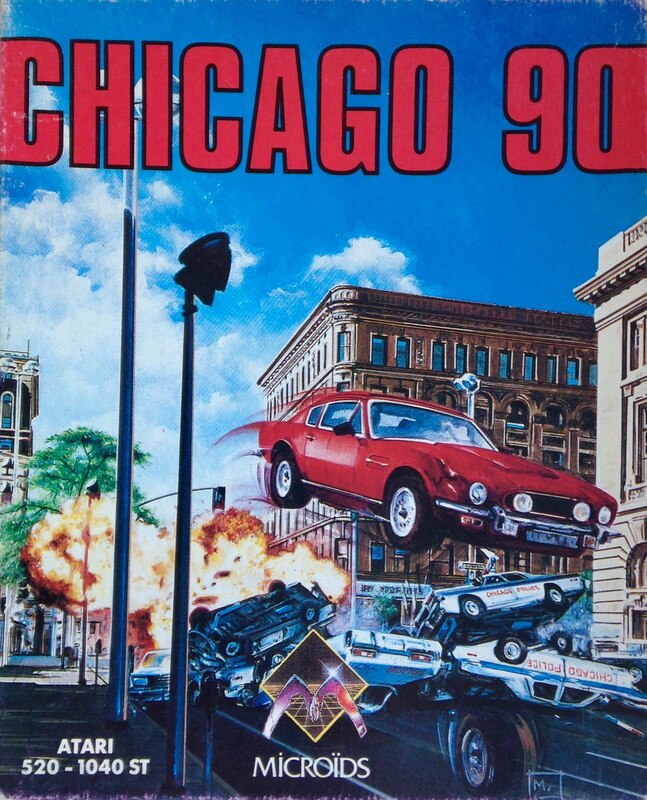 It's been a while since I posted one of my games for our Box Art group so let's remedy that with Chicago 90. Released by Microids back in 1988, it has superb cover art which portrays an exaggerated car chase scene so perfectly. I originally reviewed this last summer and, although I found it far from perfect, I still had tremendous fun and enjoyed playing it (still do). This is a fantastic example of cool Atari ST box art (even though the loading screen has a different car!). I feel it's like an early version of Driver and I highly recommended you play Chicago 90!! 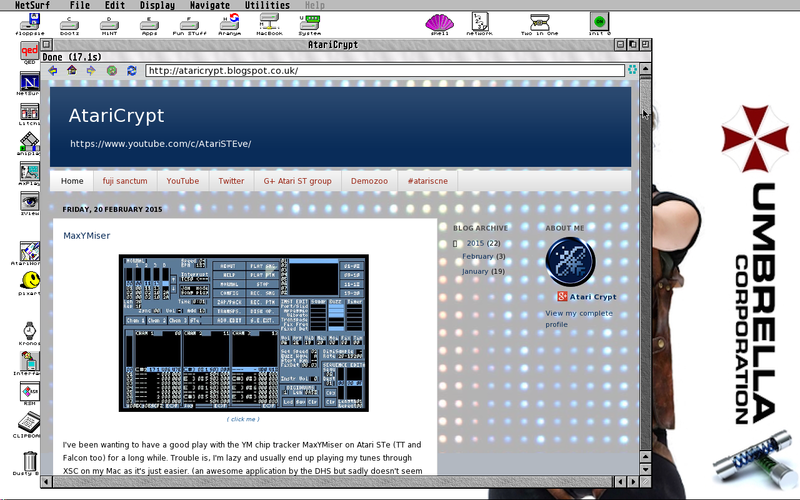 - 8bitchip have a fantastic hard drive installable version to download. - If you instead require the floppy disk image then take a look at Old Games Finder.